The first time I made Buttermilk Marinated Roast Chicken, I really wondered why this wasn’t more popular, more main stream? It’s probably the best kept secret of the century!maybe centuries really! It’s so simple yet so so delicious!! I swear with this recipe, you can say goodbye to hard, chewy tasteless roast chicken. So here is the SECRET – marinate the whole chicken in a 2 cups or so of spiced buttermilk, pop it in the fridge overnight(or freezer forever!) and see the magic when you roast it the next day! The Buttermilk would have worked it’s magic on the chicken, making it uber tender and juicy. This has really become a weakly(sometimes twice weekly!) affair cause my son loves roast chicken. Also don’t throw away those bones! Bone broth or a chicken stock made with the leftovers is so so so good and nutritious! Using the stock instead of water in curries makes it even more flavoursome.It’s liquid gold really! The buttermilk- which is basically acid , will break down the bonds and tenderise the chicken from within making it moist and delicious. In fact,yogurt or buttermilk is a very well known tenderiser.Most Indian chicken and mutton curries are marinated in a yogurt and spice mix, which makes them easier to cook, tenderises and seasons them from within. You can flavour the chicken anyway you want. Go Indian with Garam Masala or go Italian with mixed herbs or go Mexicon with a heapful of smoked paprika.Really there are endless ways to flavour this chicken! 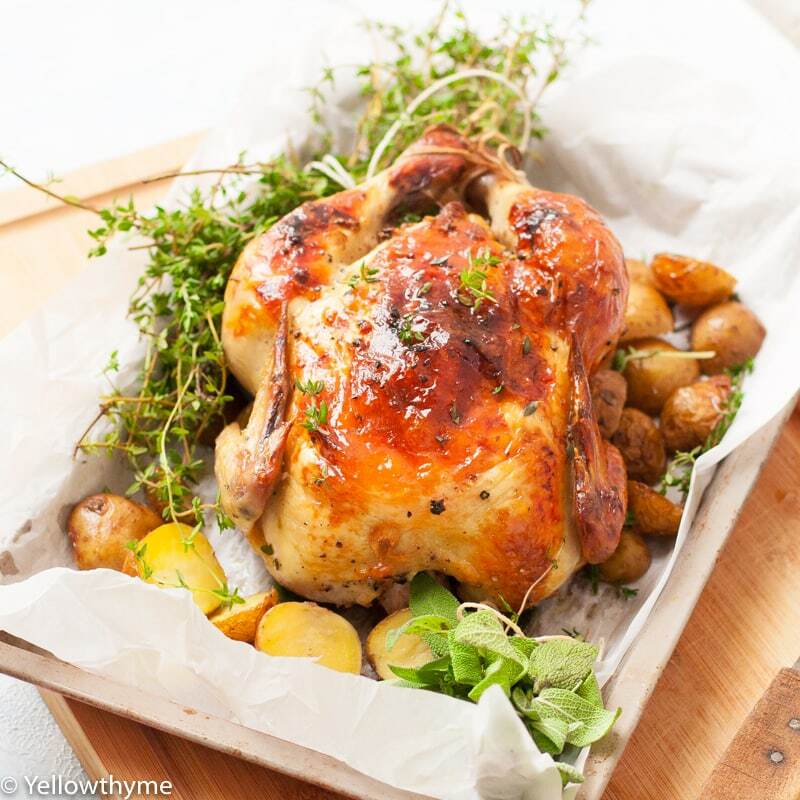 The Buttermilk Marinated Roast Chicken in the picture has only Garlic, Pepper and Salt. One thing to remember though is so OVER SEASON the buttermilk.The buttermilk will season the chicken from within and it needs to be over salted so that chicken is correctly salted.So go ahead- add a palmful of salt in the buttermilk! Mix together the garlic, pepper,salt and buttermilk.Add the Salt.The marinade should be very salty- as salty as sea water. Put the chicken inside a freezer bag.Pour the marinade over it.Marinate in the fridge for at least 2 hours to 24 hours.This can also be frozen for a month. Take the Chicken out of the fridge an hour before cooking. Pre Heat the oven to 200 degree C or 400 F.
Prepare a roasting pan or a tray.Cover it with foil. Take the chicken out of the marinade and Place the chicken on the tray- breast side down.Discard the marinade. Tie the legs together with a kitchen twine.Brush it with 1/2 tbsp of olive oil. Bake is in the oven for 40 minutes rotating the pan midway*. Take the chicken out after 40 minutes.Flip the Chicken breast side up. Bake for another 20 minutes till its golden brown on the top. In my opinion, chicken with skin retains the moisture better but if you absolutely abhor chicken skin then use a skinless chicken. Over salting the marinade will make sure the chicken is well seasoned.Otherwise the chicken can taste bland. Keep an eye on the colour of the chicken.If its browning too much- cover it with foil and continue cooking. Some more Chicken Roasts you will love!